Hello there and here we are, already moved into February and what looks like a spring weather pattern forecasted through next week (70s and 80s with chances of rain here and there). 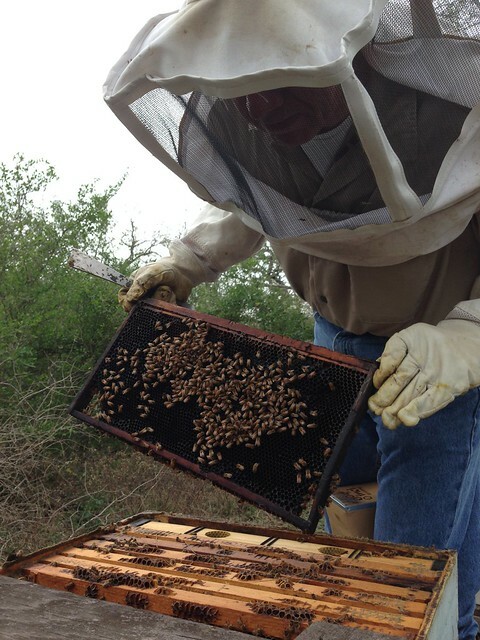 Mark’s been checking, feeding as needed in hives scattered among our different bee yards, and treating mites all fall and winter. 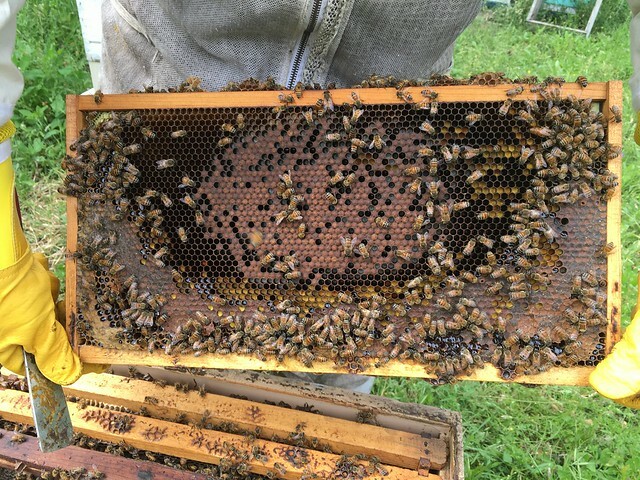 Overall our hives are getting along well this winter and he is very happy with how they look, commenting this is the best winter to date for our apiary. 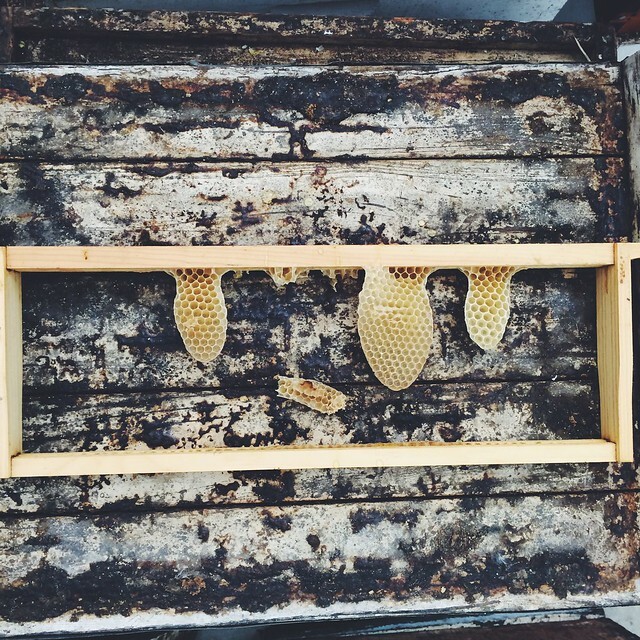 Many hives are heavy with bees and even fall honey still left on the frames – great news for the bees and for us. We are excited about the upcoming season, as always! 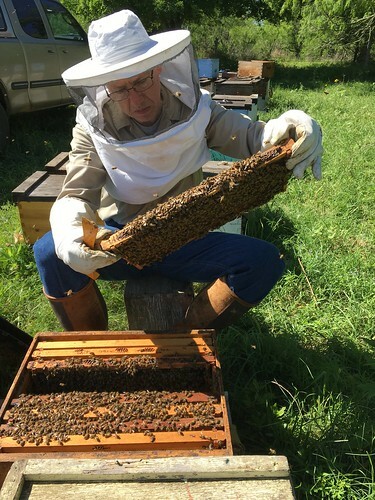 We’ve been enjoying focusing our attentions on the Bee Ranch and it is paying off – more and more people are coming to visit the two mornings we are open and classes continue to fill up (as a matter of fact, March and April are booked solid and we’ve moved into May for the Introduction to Beekeeping class). 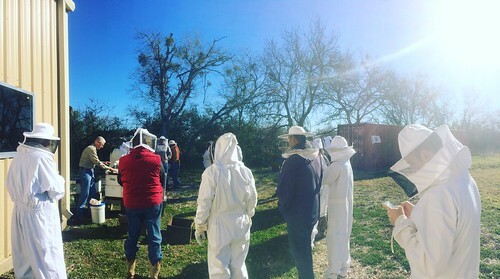 Mark’s Saturday morning workshop series continues to be a fun success and we’ve met some great folks, many of whom are eager to begin their beekeeping adventures. Here’s a list of upcoming topics for planning; hope you can join us some time in the near future! 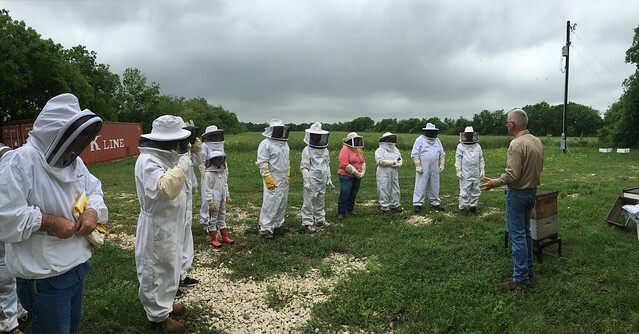 This was just yesterday when Mark demonstrated how to do an Apivar treatment for their mites to help their bees. 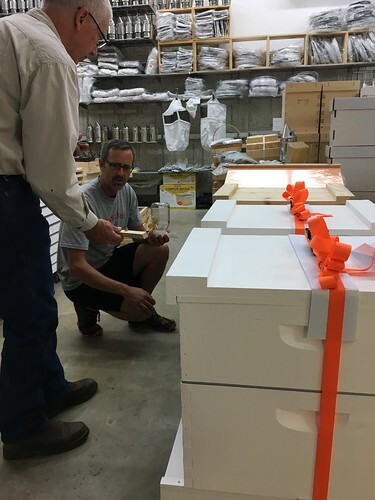 While you are here, whether it’s Wednesday or Saturday, we hope you take a look around the Honey House – Mark has done a great job filling it up with bee gear and bee equipment. We have a lot of fun learning about new products and suppliers and we enjoy sharing new things with our visitors. 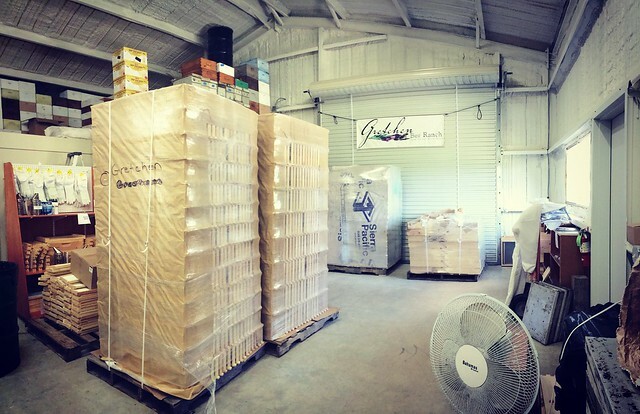 The Honey Store is also shaping up nicely and we enjoy stocking it regularly with new things we are developing – come visit us! Howdy, friends. 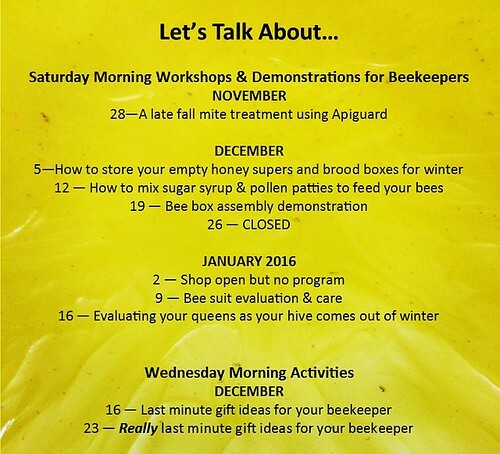 In case you haven’t seen it elsewhere – here is a listing of free workshops we are hosting at the Bee Ranch every Saturday morning through January 2016! We make a pot of hot coffee and I’ll put on hot cider for non-coffee drinkers and y’all just talk about things with Mark while I tend the shop. Pretty fun and Mark even gave away a free smoker, a $40 value, as part of a raffle for attendees. Nice and lots of fun. We hope to see you a a workshop in the near future. Ciao August! You’ve Been Awesome! Hello friends. Here we are in September already – so sorry that August got away from me before I could get a post going. We have had so much going on and pretty much all of it awesome. 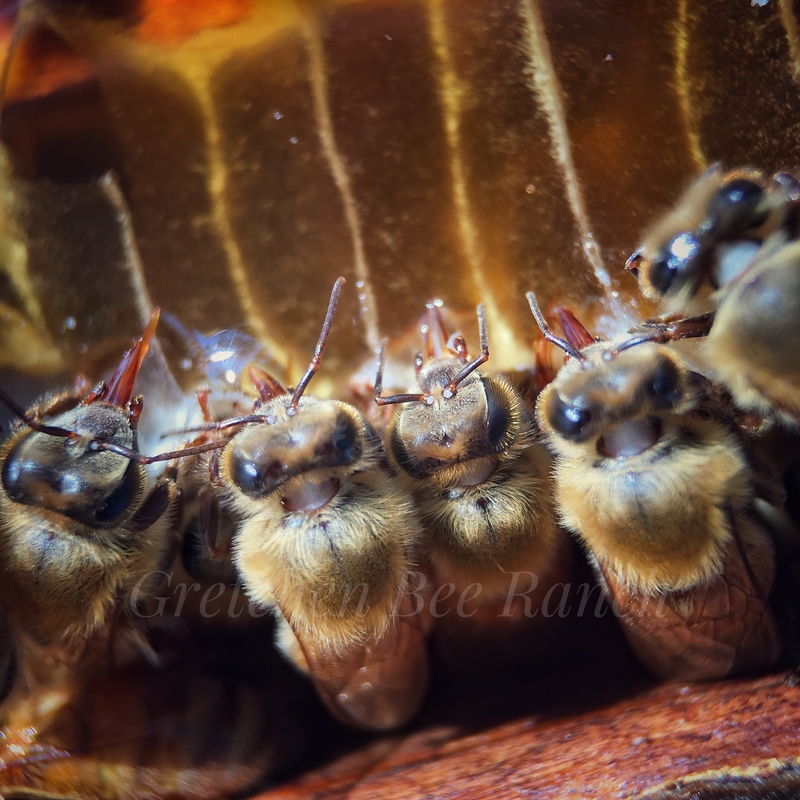 Harvest has been going very well and despite the long spells of wet spring weather, the girls finally shifted into high gear and we are at about 8500 pounds of some of the lightest, sweetest honey varieties we have ever harvested. So awesome when every honey you taste is slightly (or completely) different from bee yard to bee yard. 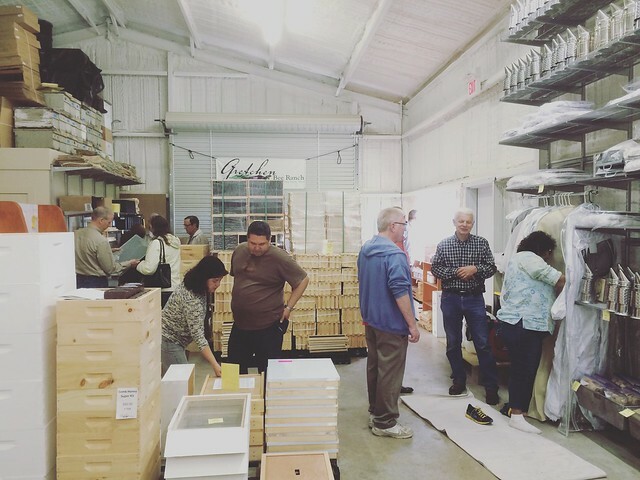 Wonderful for us and even more wonderful when we can do a honey tasting for our customers who visit the Bee Ranch. Being at home and having the Honey Store open to the public two days a week has been working very well for us and we continue to see increases on both days in terms of visitors and sales. We especially appreciate our loyal customers and friends from the San Antonio markets we previously attended – thanks y’all! 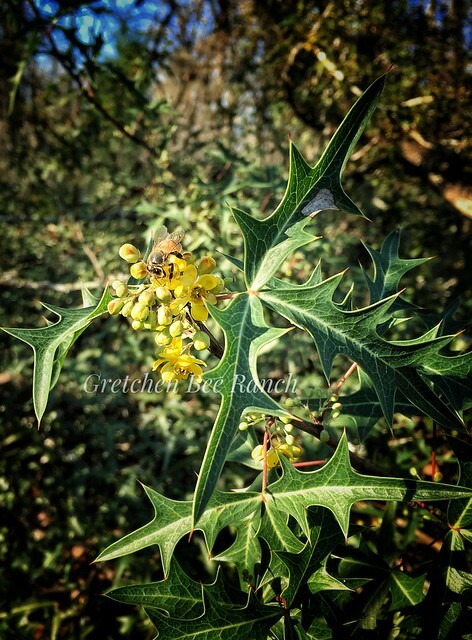 Making the trek to Seguin isn’t as bad as many of them thought it would be and being on the edge of town gives our sweet little Bee Ranch a quiet country feel but only 30 minutes from downtown San Antonio. Cool! There are still so many things to do and opportunities to explore! Ugh. There just aren’t enough hours in a day for us to do everything but what a great feeling that is for us. To know we have all these fun ideas we want to pursue when we can. 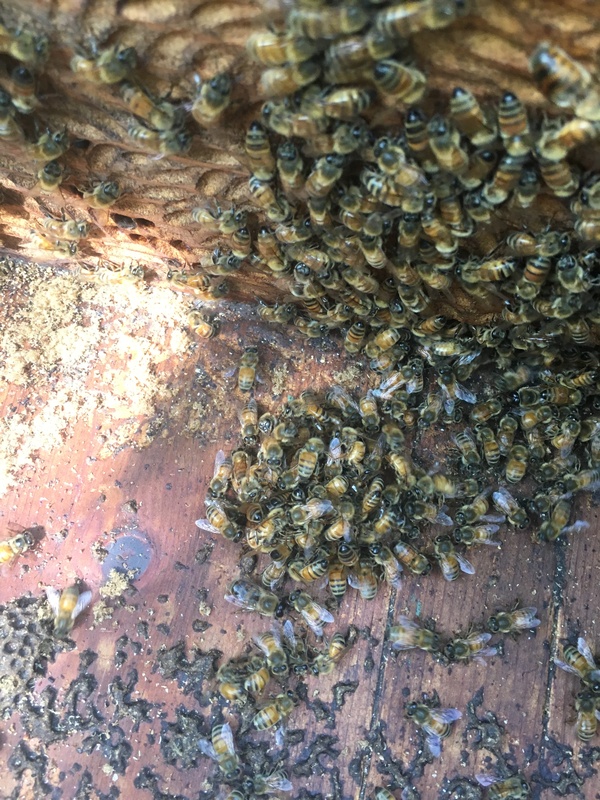 As we get older and the hot days seems to get longer (and the honey boxes seem to get heavier), we have to think about how our company and activities might need to shift in order to accommodate us. 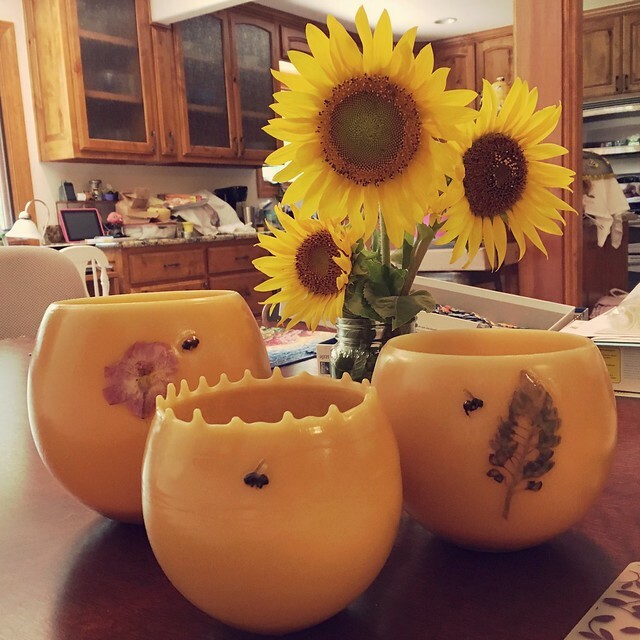 One of those things is to do another update to the website so we can list some new items such as the Pecan Creamed Honey and the sweet little Gift Jar we now offer. Another update will include at least three new recipes added to our Recipe Page. So excited about this one! I research a lot of recipes and then start experimenting and then let tasters try out what I made and provide feedback. 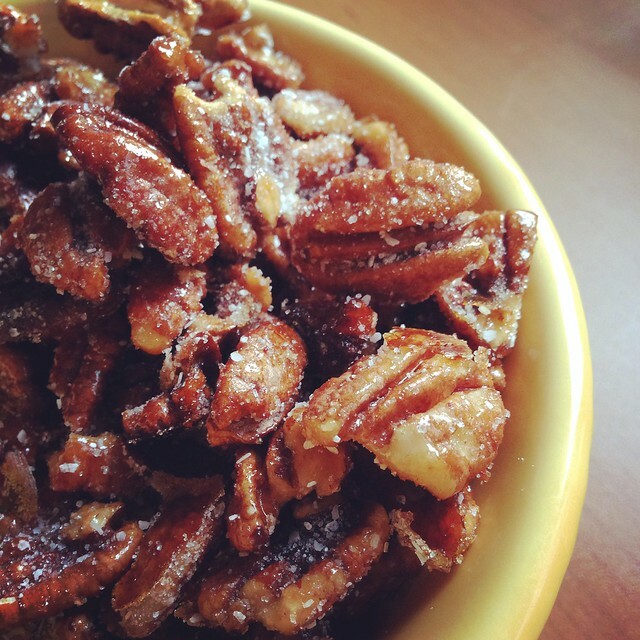 Here’s one of the things I’ve wanted to learn, get the way we like it, and then share – Honey Roasted Pecans. I think I finally got it the way I like it. I’m also working on Honey Oats Granola and a friend I met via Pearl and Instagram (Slice of Rei) has a very yummy Honey Caramel Popcorn recipe I want to see if she’ll let us post to our site. Lots of fun stuff going on here at the Bee Ranch. 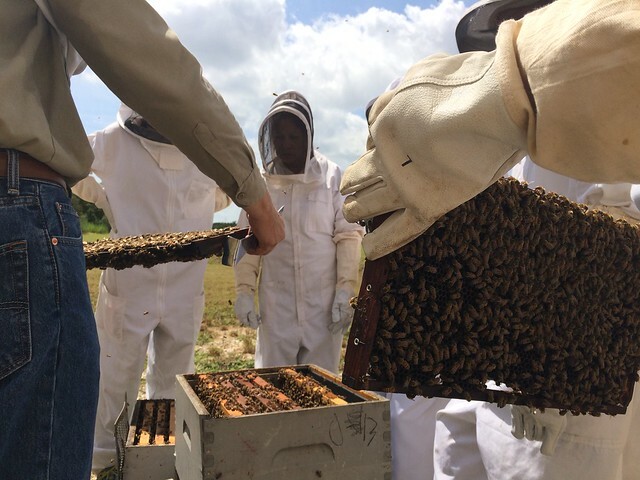 Our Beeventures have also taken us down the road of selling beekeeping equipment and supplies. 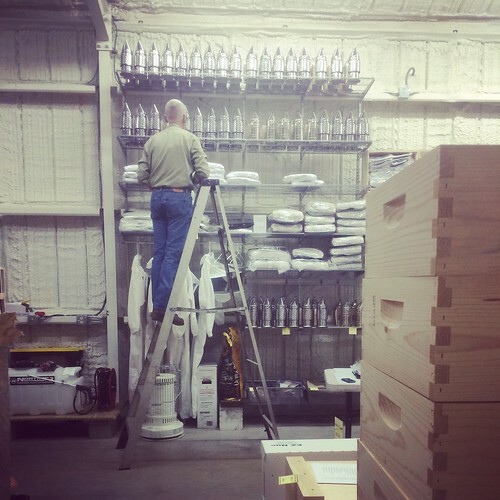 If you haven’t visited us lately in Seguin, you don’t know we carry everything you need to get started with bees and to keep going. 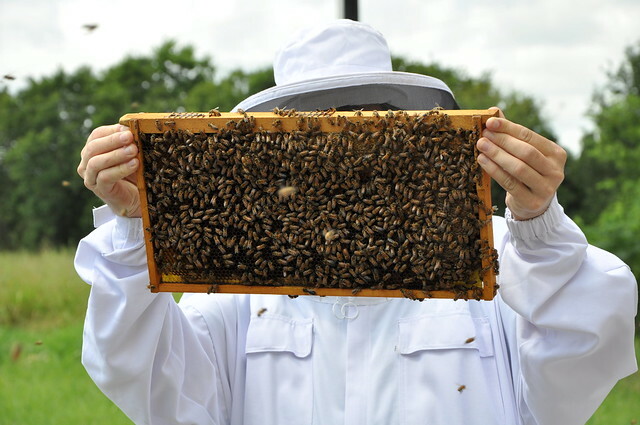 Bee-gear (veil, suits), honey extraction equipment and tools, boxes, frames – ask us. We might have it now. So excited for Mark to do something he’s been thinking about for years. 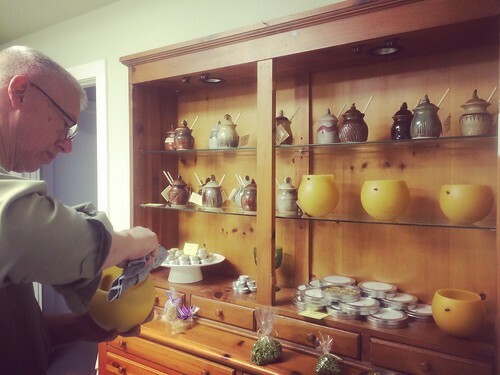 Our students kept coming back to us with requests for supplies and Mark has been working hard to find the best quality items for a good price. We sell only what we use so if we’ve got it, you can ask us what we think about it. Check us out sometime! 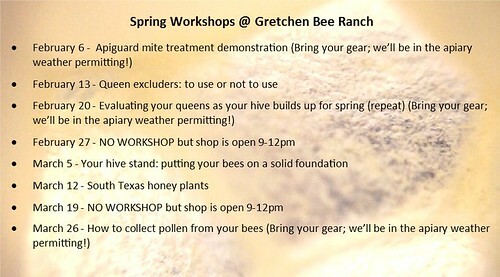 We’d love to see you at the Bee Ranch. That’s it for now as I need to run to an appointment. More Beeventures and more posting over on our other social media outlets (Facebook, Instagram, Twitter, Tumblr).